So here we are, over a month into, what is already shaping up to be an impressive year for up-and-coming Scottish music... and I've finally ventured up the A9, all the way to Aberdeen... via Australia though! The reason being, to introduce you all to Joseph Sutherland, a.k.a. Foxhunting. His debut album Come On Sweetheart, Take My Heart is out now and is really very good indeed, even more impressive when you consider Joe is but a young 'un... an incredibly talented one at that! So, while you're reading what he has to say for himself, have a listen to the brilliant December. Joseph: Foxhunting is Joseph, a now-19-year-old boy from Aberdeen. I entered a talent contest at my secondary school in 2004 and came second to a twin Proclaimers tribute act. I've been playing guitar since my father thrust one into my hands aged 12, started with a few chords and learning progressions. By 14 I was writing some (fairly rubbish) songs using four-chord structures. I'm still doing that today, but with a bit more imagination in the lyrics department. 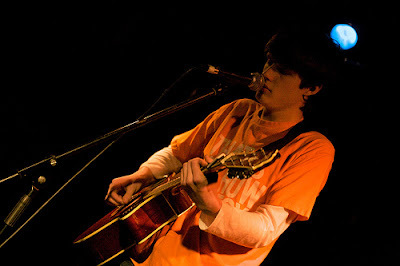 Joseph: I like to think that I'm not just another acoustic guitarist, even though I plainly am. I'm currently experimenting with pedals and loops to try and define myself a little more, but I think having a more alternative listening background allows me to pigeonhole myself into the more "angular" side of pop. As I was learning to write music I was listening to a lot of Bloc Party, Editors and Snow Patrol, which showed in my voice. Thankfully I no longer sing with a thick Irish accent. Joseph: Plugging, hey? Not a fan of plugging, I prefer to let the water run free. Hur hur. More seriously, I recently recorded an album in three weeks with Iain McPherson of Bedford Records - doing an album in three weeks is not recommended, by the way - called Come On Sweetheart, Take My Hand. It's one big experiment, if I'm honest, with a lot of last-minute ideas on the platter, but most of the songs I've been bumbling about with and tinkering for years. It has an underlying theme of nature and human emotion which carries through on each track. Kowalskiy: What else can we expect from you in the future? Joseph: Well, hopefully I'll get a few more shows under my belt and start gigging in places like Glasgow and Edinburgh. I'm fairly new to the gigging scene even in Aberdeen, so I'll look to get myself a promoter to look into that for me when I return to the UK from Australia. Material-wise I'm in the middle of writing a new EP/album which I hope to get home-recorded in the near future. I'm also planning, as I say, to expand my sound so you can hopefully expect something a bit more visceral and pedal-fuelled in future. So... onto the all-important album details! If you fancy getting your hands on Come On Sweetheart, Take My Hand then head over to the Foxhunting Bandcamp page. Thrown into the mix is a copy of last years self-titled EP, a hidden track, liner notes and a choice of four album covers. In fact, choice is the order of the day as far as the album is concerned, with half the tracks, including Blood, or, And I Was Right, (streaming below) being dual-titled to let you decide which is more apt. Pretty nifty eh? !